Now is the time. The political and legal ducks are aligned. There is a friendly government. But we need your solutions. As a government we are not going to impose solutions. With your leadership we can and will make enormous progress for all of us. There is no need to refight battles that have already been won. Limited resources, time and energy have to be expended on building - not fighting. On creating - not destroying. Minister of Justice and Attorney General of Canada Jody Wilson-Raybould speaks during a news conference, June 30, 2016. (THE CANADIAN PRESS/Adrian Wyld). The Honourable Jody Wilson-Raybould, PC, QC, MP. 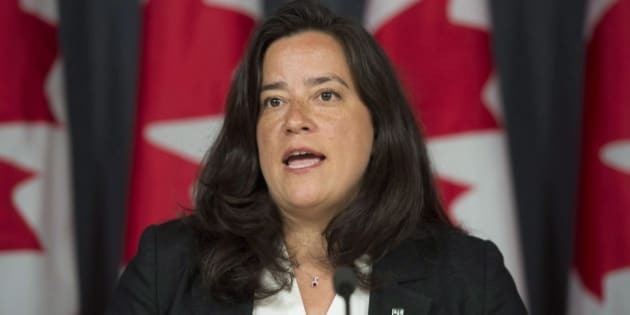 Minister of Justice and Attorney General of Canada, appeared before the Assembly of First Nations Annual General Assembly on Tuesday. Here are her prepared remarks. Gilakas'la. Good Morning, Elders, youth, National Chief, Regional Chiefs, Chiefs, Grand Chiefs, Minister Bennett, ladies and gentlemen. Thank you the Elder for the opening prayer and to Chief Ava Hill, our host, and Regional Chief Isadore Day for your welcoming comments. I acknowledge the Haudenosaunee and the peoples of the Six Nations of the Grand River on whose ancestral lands we are gathering. Yes, National Chief this has been a momentous year - and yes the momentum is gaining. And Indigenous voices are increasingly shaping our country. Voter turnout in the 2015 federal election was up significantly - up by as much as 270 percent in some communities, and a record 10 Indigenous people were elected to Parliament. And yes people are taking note. For example, some of you may have seen a recent article observing how, "Indigenous MPs and senators played a central role in securing passage of the new assisted dying law", bringing "unique perspective". And it is true, we did seek consensus where consensus could be achieved - very much in the spirit of Indigenous political traditions and a non-partisan approach to decision making. And yes there is momentum with the pre-inquiry consultations regarding missing and murdered Indigenous women and girls - and with beginning an early review of the Crown's position in select litigation regarding Indigenous issues. And yes, our government has adopted, without qualifications, the United Nations Declaration on the Rights of Indigenous Peoples. These are all incredibly important advances. But...... it is still only the start. So - National Chief Bellgarde - while I want to thank you for your optimistic and very encouraging words this morning - and for taking the time to reflect on what has transpired in the last year since Montreal - what was most important to me from your words is a signalling of the hard work that remains before us all - and, in particular, rebuilding the Nation-to-Nation relationship. While we must, and will, address the social issues now - education, child welfare and health - and consider the immediate needs with respect to closing the financial gap - in truth, the social and economic gaps will never be fully closed until the foundational work of Nation rebuilding has been completed... the Indian Act gone - and where Indigenous peoples are making decisions for themselves - and where the role of the federal government has been transformed from one designing and administering programs and services for Indigenous peoples, into one that supports self-governing Indigenous Nations in a genuine Nation-to-Nation relationship. So yes, the real work is ahead of us - and that is the message I am here to deliver today. And, in this regard, we are all very fortunate to have a Prime Minister who understands this and has tasked all of his Ministers with working towards a renewed Nation-to-Nation relationship with Indigenous peoples, based on "recognition of rights, respect, co-operation and partnership." So, with my time this morning, I want to talk about this relationship and share some thoughts on how we can focus our efforts to collectively set in place a course of action over the coming months that ensures we can turn all the good words - the good will - and the golden opportunity we have - into meaningful progress with practical and discernable benefits on the ground within Indigenous communities. To undertake transformative change. And I challenge the critics that say it cannot be done - those, who on the one hand, say the government is not serious or sincere, and on the other, say that Indigenous peoples do not have what it will take or the resolve or that the task is too great. Moving forward, our government's principled approach to a Nation-to-Nation relationship based on recognition does raise some very fundamental questions that must be answered in order to proceed. First and foremost, it begs the question, "what are the Indigenous Nations that are to be recognized"? That is, how will you define yourselves as Nations? What are the structures through which you will deliver programs and services? And, then, what will your relationship with Canada, with your neighbours, and with other Indigenous Nations, look like? How will you resolve your differences between and amongst yourselves? In answering these questions, I think we can all agree that the federally imposed Indian Act is not the answer even though it is, as a result of the colonial legacy, necessarily a starting point for conversations in communities where the Indian Act system is, in most cases, currently the primary system of administration in place. Even though it is a system that reflects an impoverished notion of governance, one that is fundamentally inconsistent with the United Nations Declaration. Let me explore this thought further. The seventh preambular paragraph in the UNDRIP speaks to promoting the inherent rights of Indigenous peoples which derive from their political, economic and social structures - i.e., not those imposed by the state, of which the Indian Act is a case in point. Article 3 says Indigenous peoples have a right to self-determination and by virtue of that right to freely pursue their economic, social and cultural development. And Article 5 says Indigenous peoples have the right to maintain and strengthen their distinct political, legal, economic, social and cultural institutions, while retaining their right to participate fully, if they so choose, in the political, economic, social and cultural life of the State. So again it begs the question, what are the political, economic and social structures that the federal government should recognize and that the UNDRIP speaks to and what is the relationship of those institutions to the federal machinery of government? And as we all know, there is no simple answer. It is, unfortunately, not as simple as just ripping up the Indian Act. Although, if we are speaking openly, adopting the UNDRIP should really require us to do so. But, in so doing, we would also create legal and economic uncertainty during the period of transition. How we deal with the existing administrative structures on-reserve, including the Indian Act mechanisms that already exist to support the transition, must be carefully considered. There is already significant infrastructure and steps towards economic improvement on many reserves - so we have to be very careful about the new mechanisms that we put in place. To build on our success. At the same time we also have to be mindful of the vested interests in the status quo that are resistant to change. Not to mention the citizens of the Nations who may be afraid of change and more comfortable with the devil they know than the devil they do not. But this is the challenge of Nation rebuilding - something that those of us in this room who have been dealing with these issues for years fully understand and embrace. So as much as I would tomorrow like to cast into the fire of history the Indian Act so that the Nations can be reborn in its ashes - this is not a practical option - which is why simplistic approaches, such as adopting the UNDRIP as being Canadian law are unworkable and, respectfully, a political distraction to undertaking the hard work required to actually implement it. What we need is an efficient process of transition that lights a fire under the process of decolonization but does so in a controlled manner that respects where Indigenous communities are in terms of rebuilding. As was described to me by one chief when I was BC Regional Chief, rather than popping the balloon that is the Indian Act, we need to let the air out slowly in a controlled and deliberate manner - slowly until it is all gone and when it is all out what replaces it will be strong and healthy First Nation governments - governments that design and deliver their own programs and services. This approach is consistent with article 38 of the UNDRIP which sets out that the role of the state, in consultation and cooperation with Indigenous peoples, is to take the appropriate measures to achieve the ends of the Declaration. Accordingly the way the UNDRIP will get implemented in Canada will be through a mixture of legislation, policy and action initiated and taken by Indigenous Nations themselves. Ultimately, the UNDRIP will be articulated through the constitutional framework of section 35. So what are the improved or new mechanisms we need to support the Nation-to-Nation relationship? What legislation or changes to policy do we need now and in the future? To create the legal and political space for Indigenous peoples to move forward - to breathe life into Section 35. What the federal government can do now is begin the process to recognize your Nations and your legitimate institutions of government. What we can do - in full partnership - is to facilitate the transition - to set us on an irreversible path of action - and to develop a national reconciliation framework with improved and new mechanisms to guide this transition to rebuilding strong, self-determining Nations with practicing and thriving cultures. This includes mechanisms to negotiate modern treaties under new mandates as well as other constructive arrangements that will provide a clear and predictable path for Indigenous peoples and governments for the exercise of decision-making and governance. It means supporting Nation building in the context of historic treaties and, where there are no treaties, respecting the proper title-holders. It means creating new mechanisms to facilitate self-government beyond the Indian Act band. And we need to get moving on developing these mechanisms as soon as possible. And yes this work will be controversial. But it is absolutely necessary. And it cannot take multiple generations. We do not have time. By some accounts at the current rate of negotiating our way out of the dysfunction of the Indian Act system using existing mechanisms would take 600 years. This is not acceptable. work well under way to develop and implement the mechanisms to support the transition in this, what some have called, "the age of recognition". We simply cannot waste time on reinventing the wheel or replicating reports of yesterday - we must act with conviction and determination. As a proud Indigenous person as well as a proud Canadian, I know that my future and the future of the generations to come, is inextricably tied to the success of the project of creating a stronger Canada that is inclusive and respects diversity - a post-nation state that recognizes pluralism and a system of government that supports this objective. Strong Indigenous Nations are a part of this vision. Legitimate and strong Indigenous Nations have already begun to change the way Canada is governed for the better, and will continue to do so. There is room in our country for different legal traditions and ways of governing - for an approach that respects diversity and equality and supports the social and economic advancement of Indigenous peoples as part of our evolving system of cooperative federalism and multi-level governance. It is what distinguishes Canada as a Nation from other Nations of the world where ethnic tensions threaten cohesion and with this, social and economic stability - indeed human progress. Accordingly there is no place within today's Canada for governments to deny the place of Indigenous peoples to participate fully in decisions that directly and significantly affect them or where rights require action or jurisdiction to be respected. And to this end the Nation-to-Nation relationship is so critical. Where land-use decisions are being made that affect Indigenous peoples, the legitimate and recognized governments of those peoples must be able to participate in shared decision-making with other levels of government. For me, this is how free, prior and informed consent is operationalized. to facilitate building the tools and processes needed to bridge between the present and that future state. On this note, the previous government enacted a suite of legislation that I, along with many others and you, have said is inconsistent with developing a Nation-to-Nation relationship, and as we develop the mechanisms to the transition we will have to reconsider this legislation. And, of course, there will continue to be litigation between Indigenous peoples and the Crown, and courts are not the place to build reconciliation. Accordingly, my role as Minister of Justice and Attorney General is to ensure the Charter is upheld and that the legal positions taken by the Crown in court are consistent with the commitments and values of our government with respect to the evolving Nation-to-Nation relationship with Indigenous peoples. By way of conclusion, let me leave you with these final thoughts. Now is the time. The political and legal ducks are aligned. There is a friendly government. But we need your solutions. As a government we are not going to impose solutions. With your leadership we can and will make enormous progress for all of us. There is no need to refight battles that have already been won. Limited resources, time and energy have to be expended on building - not fighting. On creating - not destroying. On empowering - not denying. Pressing social issues must be addressed now. But Nations need to be ready to assume jurisdiction and the concomitant responsibility in light of recognition. And while the federal government has a crucial supporting role to play, the hard work is going to be in the community, something I strongly advocated when Regional Chief. As I have said in the commons during the Attawapiskat debate, only the colonized can actually decolonize. No one else can do it for you. So collectively are we ready to implement the UNDRIP? Are we ready to finish the unfinished business of Confederation? I say we are. I know we are.